Flowers in the wine department: Loose floral vignettes at a Nugget Market in California were created with the help of Photoshop-altered watercolor renderings. Kelley Burnham wields really big brushes and even mops to yield a really big "watercolor. " 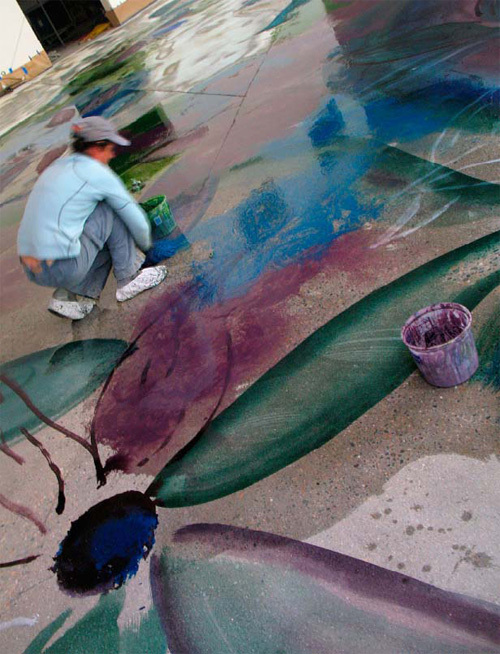 Art techniques such as bleeds work equally well on rag paper and ground concrete. Whether more utilitarian or more exotic, these are forms that every general contractor and every concrete guy is familiar with. We all have the tools and the formulae to produce these lines, angles and shapes. But they require attention to detail, are easy to be critical about and take time. Time is money. And being judged when your attention to detail was less than just right is money with wings that flies out of your bank account or wallet. As less of a structural and more of a finishes guy, I have tools and formulae too. And, very occasionally, I have to use them. But we've been fortunate to develop patrons who appreciate that they get the best value (more "bitchin " details, more art) when we're able to work freehand. Freehand is faster, it's more fun, and it gives clients less opportunities to judge us critically. Obviously, this is good for us. It's also good for them. They're able to enjoy surprises (and, boy, does every job yield surprises) and they don't have to be judgmental. It's amazing how an 89.5-degree angle or a less-than-perfect circle can turn an otherwise great client into a real jerk. And who wants to have to be a jerk? One of our special clients is our good friend and patron, Jeff Albright, facilities director for California grocery store chain Nugget Markets. Jeff must've been a great kid to buy presents for. He lets you know what he wants and is then happy with what he gets. "Grandma, I'd like a firetruck please. Oh great, a police car ... I really love it! " Jeff is smart and he works hard too. He's also lucky and he knows it. He's thoughtful, puts in the time, and then accepts what the universe has in store for him. Dye and pigment washes allow nuances of the ground concrete substrate, such as aggregate cross sections and craze cracking, to show through. In California, these are called "bitchin " details. Both Nugget Markets and the concretist have thrived as a result of this. The photos featured in this column are of our third Nugget Market, where we worked with Jeff. The theme he suggested was "sunflowers. " This was expanded into "florals. " A ground and patina-stained field was punctuated with loose floral vignettes delineating departments and specialty areas. These ideas were elaborated through Photoshop-altered watercolor renderings. Jeff and his Nugget crew were responsible for the grinding, while the concretist treated this "canvas " as one really big watercolor. All layout and material application was by hand and by eye, with no mechanical aids. If a petal was an inch off, great! If it was a foot off, even better! This is a really fun and liberating way to work. It makes you look forward to putting in the extra time if, while in mid-process, it's determined that another one or two sunflowers will really make the composition. And it's normally the artist or the artisan team who makes this decision. No need to find Jeff. Better that he be surprised. The field was stained with Patinaetch stain by Colormaker and enhanced with Colormaker's Deso Dyes and Aquacolor micronized pigments. 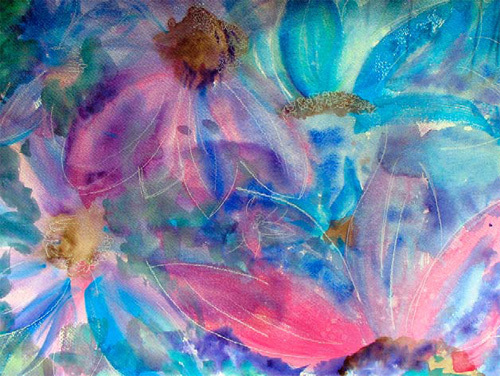 Floral vignettes were produced with really large brushes, mops and sponges applying saturated combinations of these same dyes and pigments in a thinned-down water-based acrylic solution. 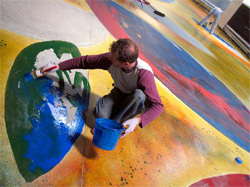 Art techniques such as bleeds work just as well on rag paper or ground concrete. The floor was sealed by us with Surtec's Stone Seal and finished by Jeff's guys with Surtec's FS-600. Both the seal and the finish were also water-based acrylics. What's great about this system is that dye/pigment washes allow all of the nuances of the substrate to show through - aggregate cross-section, crazing, even the occasional construction-related trauma such as spalls. 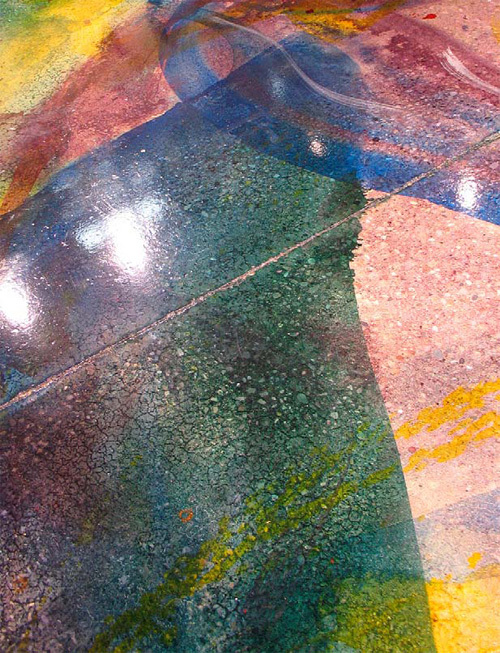 This is both art AND sensory concrete at its best! Jeff didn't like it. Not at all. He was surprised. And he knows he's one lucky guy, blessed really, so he loved it. Concretist artist associate Martin Webb applies thinned water-based acrylic, intensely saturated with Deso Dye Concentrates and Aquacolors from Colormaker. The layout and material application was done by hand and by eye, with no mechanical aids. That's one really big watercolor! We're lucky, too, lucky to have had Jeff as our client and to have been able to work by hand and by eye. In between our second and this third market for Nugget, Jeff opened another store for which the budget was a bit skimpy. He's a really capable guy with a really capable crew. He knew he couldn't afford the concretist on this one and (thank God) decided to struggle through it himself. I give thanks because what he was looking for was a 50,000-square-foot checkerboard, with the squares further delineated by saw-cut joints. No room for error! The only "art " was in templated and blasted logos. He was able to eliminate our subcontractor markup and did a really super job. It looked great. It also took about five times as long as he thought it would to complete. Hence, next store, he went back to the concretist working by hand and by eye.